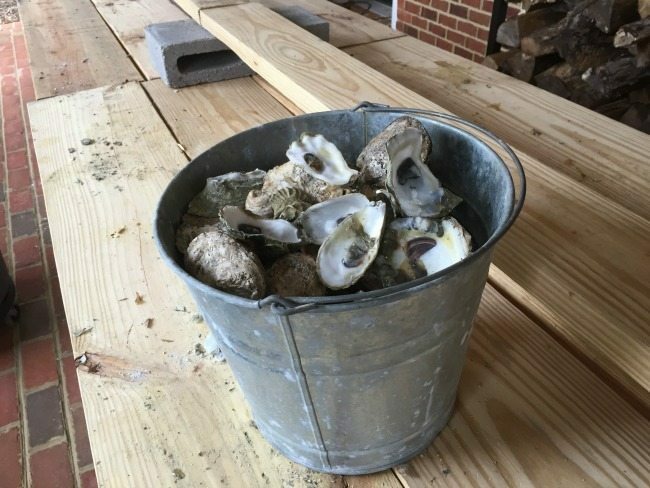 I was asked by Maria Long, the gracious proprietor of this fine blog to author a guest blog about a recent oyster roast that my wife and I had hosted and Maria and her husband were kind enough to attend. First and foremost the most sociable of all parties in my opinion is an oyster roast. Here is a simple guide to make even the first timer look like a pro. Rule number one is to have fun, and it will be. I am going to succinctly break the party down into three groups: party prep, food and miscellaneous. Any other questions? Please don’t Google it [unless desperate], think about it and figure it out for yourself. That is part of the fun and the challenge. Every situation is unique. Make the “roast” your own and put your signature on it. 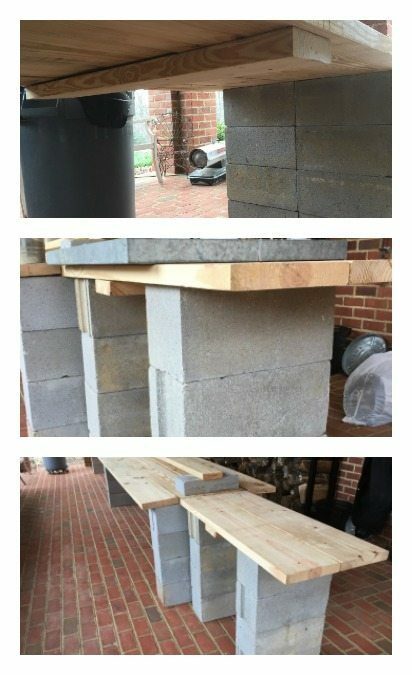 My oyster roast table fabrication plans are easy and inexpensive. If your party is around 20-40 people, I construct a table on level ground that is twenty feet in length, thirty-seven inches wide and thirty-six inches tall. See Pictures below; it is easier to follow the pictures in how the assembly went together than typing another 500 words about it, but some brief instructions: 4 2 x10s placed parallel on top of 8 8” cinder blocks stacked 4 high, the 2x10s are only attached to the cinder blocks by gravity, I have joined the 2x10s together with a scrap board screwed on the bottom, I highly recommend this as it makes the table more sturdy. In the pictures you will see two rolls of paper towels per ten foot of table. I had some left over ¾” CPVC pipe and I added two T fittings on the top, drilled a hole in the 2×6, but not all the way through, just far enough to secure the CPVC pipe. 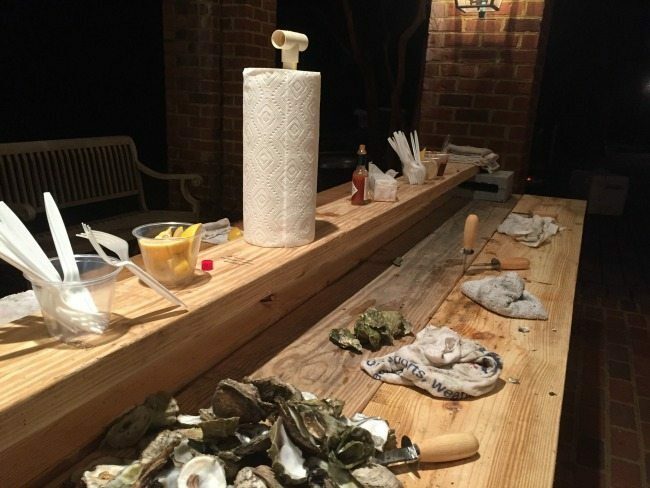 Also please note that the 2×6 is raised up on the 4” cinder blocks that are laid flat and elevated enough up off the table to stay clear of the oysters and shucking. This shelf is where the crackers, lemons, cocktail sauce terry cloth towels and tabasco sauce are placed. Knives conveniently fit point down in between the cracks in the 2×10 boards. 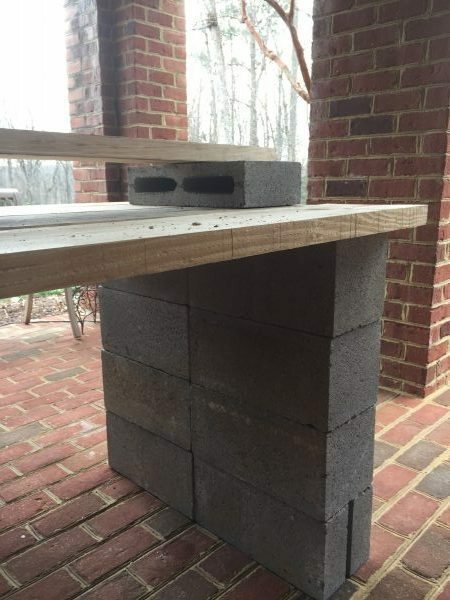 Cinder blocks cost about $1.50 each, Boards $8 each, quick math for a twenty foot table is approx. $156 before tax. A thirty foot table approx. $210. What to do with the material if you cannot store it afterwards? Easy take it to a Habitat for Humanity drop off location where they will give you a tax deduction and you did something positive. Ok, not a total necessity but your guests need somewhere to throw the shells. I happened to have a lot of old galvanized buckets. Call me a purist, but an empty shell hitting a metal bucket sounds like coins coming out of slot machine to a gambler, it just sounds right. If not in the budget or already collecting dust in your garage use any bucket. 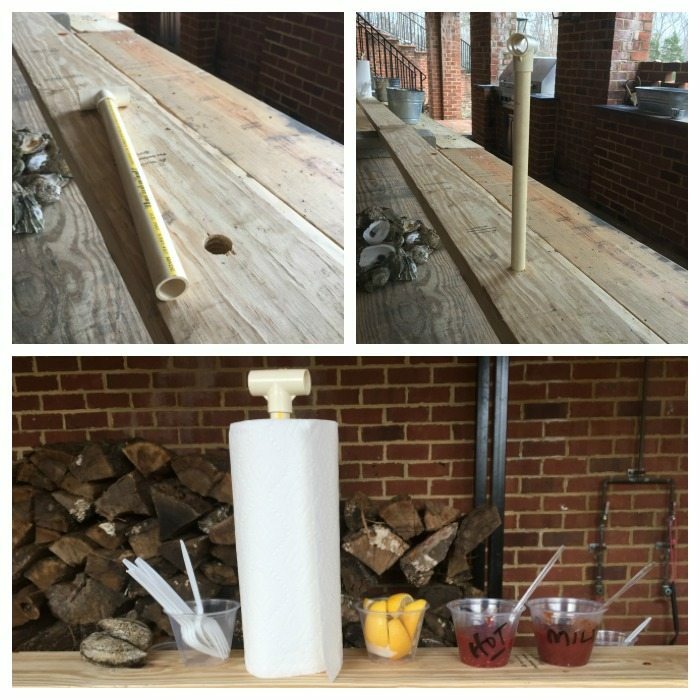 I also like carrying the theme through with beer/drinks in galvanized buckets or troughs and old church keys [inexpensive] tied on cord to open bottles. I know this may be a step to far for most, but much can be said for the presentation. And a big part of entertaining is presentation. Acquiring a fresh source of oysters is key, call around to your local seafood purveyors and inquire about what are in their opinion the best oysters they are receiving and how fresh. Order ahead of time if possible. My rule of thumb is a dozen oysters per person. A bushel of oysters typically contains 180-190 of medium to large oysters, but this may vary. After purchase, keep them cold but do not let them sit in water that has melted from the ice, best to keep the cooler drain open. Lay the oysters out on the drive and patio and evaluate. Are they dirty then wash them off with a garden hose and gently scrub them if needed. Any oysters that are open tap them on the shell to see if they close, if they do not discard. It is inevitable that you will get a few bad oysters but there should only be a handful. I like to offer my guests a combination of roasted and raw oysters. To shuck or not to shuck? If shucking please shuck as close to guest arrival as possible. Remember raw oysters are alive and should be eaten soon after shucking. 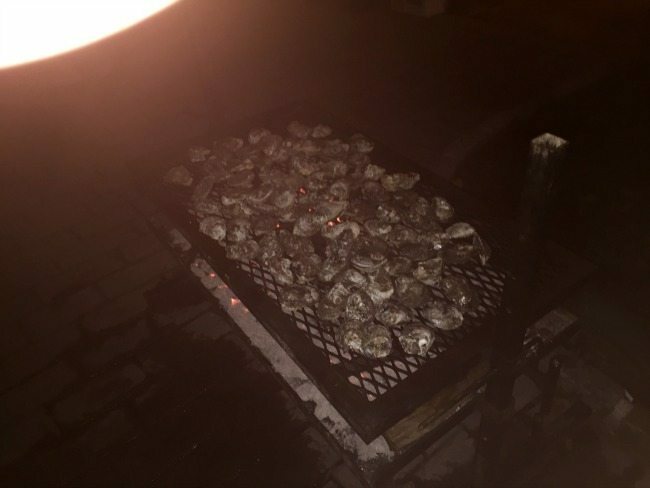 I prefer to use charcoal and hickory over a grate to roast my oysters but any method will do: gas grill, fire pit with rack, fire barrel or even cooking them on a steel plate over a flame. Whatever works for you or what you have available will work. The oysters come out the same, roasted. 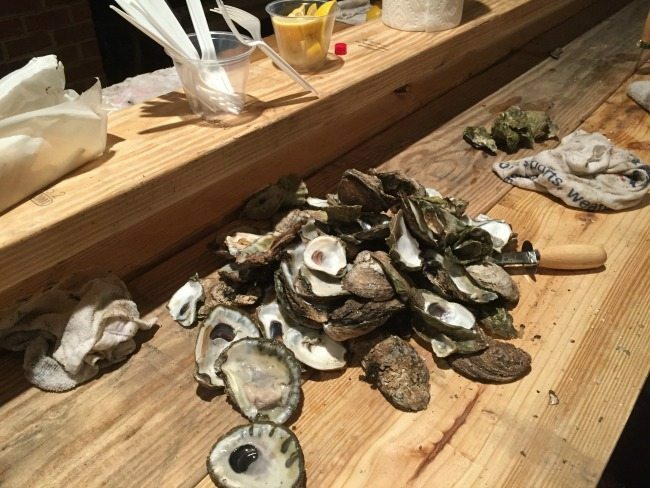 A few additional pointers, make sure your cooking surface is large enough to handle the party numbers, always roast with a very wet piece of burlap over the oysters on the grill, this really help keep the oysters roast quicker. Burlap should be resoaked in a bucket of water between roasting each batch. It is recommended that you try to roast your oysters with the curved part of the shell on the cooking surface. This allows the oyster to cook in its own juices. Do not sweat this detail as roasting for large numbers it is almost impossible to achieve. Roast the oysters until the shells just begin to crack open. You want your oyster warm and juicy, not overcooked and devoid of the natural juices. And a side note on horseradish: buy several roots and mince your own. I highly recommend mincing your horseradish in a food processor. Saves time and aggravation. When cleaning the horseradish root try to shave as much of the brown outer root skin off, but do not worry about getting all of it off as it all tastes the same and is edible. Do not forget to rinse your horseradish off before preparing! And make it the day before, the sauce really needs to sit in the refrigerator overnight so all of the flavors come together. My recommendation is to make two kinds: hot and medium. Yes, a necessity. And don’t bother unpacking them. Simply lay the sleeve out on the 2×6, cut a slit with a pair of scissors down the top of the sleeve long ways and open, the package will hold the saltines together. I like Tabasco sauce and that’s it, but it is your party, add any sauce creation or side you prefer. Make sure you purchase a couple of Tabasco bottles so that there is enough to go around. They are inexpensive. Cups, you need short clear plastic cups, I prefer the heavier plastic ones than the thin wine glass kind, these are good for your cocktail sauce, lemons, forks, etc.. You can also write on them if you have a mild and a hot cocktail sauce. Plastic spoons and forks, inexpensive, disposable and a necessity. Oyster/Clam knives with a wooden handle; length 2 ¾”. A deal at $1.15. You will need enough knives and my rule of thumb is one knife per 1.5 guests. I just made that up, but you can figure out how many you need and can afford and they last forever. Not paper, terry cloth towels. These afford your guests a good grip on the oyster and prevent accidents, like an oyster knife to the hand. For your rookie guests you may have to explain what the towels are for. If you do not have enough towels, i.e. dish towels, college spirit towels [we have enough to fill a stadium] then buy some. The best location is Home Depot. A 60 pack of 14” x 17” terry cloth towels is only $20. And after the party they are great for cleaning and car washing. Oysters are meant to be consumed outside. 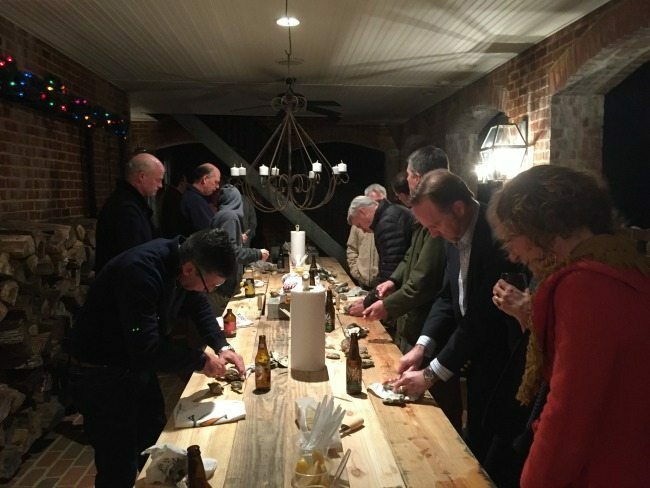 When we hosted our “roast” it was around 28 degrees Fahrenheit and we had two heaters under the table and three 65,000 BTU torpedo heaters blowing on our guests to make it tolerable. We had the luxury of having it under a raised deck so some of the heat stayed where it was, Bottom line no one complained and the food and company was superb. 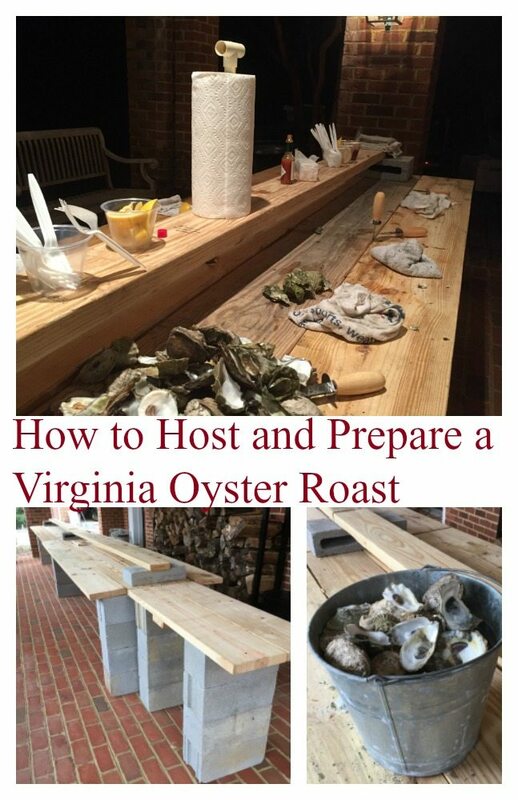 Obviously do to constraints I could not cover every detail, but addresses most of the salient points of preparing a not so proper Virginia Oyster Roast. Finally, good food, good drink and good friends standing around a long table outdoors is hands down the best party ever. Have fun. I’ve never seen an oyster roast before, but that may be because I don’t like oysters. Haha. This does look like fun though and like everyone had a good time. Wow, props to you for an oyster roast. I’m not a big fan of oysters but this looks like you went all out. I’ve never heard of doing a roast for them either. How cool. I honestly never had oysters before but my husband? he’s a HUGE oyster fan. I think he would love a party like this. I would be more then happy to attend an Oyster Roast. I live in an apartment near NYC so for me to host one—–uh don’t think so–but then I never say never!! I’ve never been to an oyster roast before. It looks like a lot of fun! This table looks like a great plan. I am sure everyone will enjoy the oyster roast. Oysters are absolutely my favorite and I liked the way you presented. Thanks for sharing!! Okay! Random question! Does it stink up the place a little bit because of the oysters? Like does it have the seafood smell? I love oysters! I wish I could have them as often as I wish. 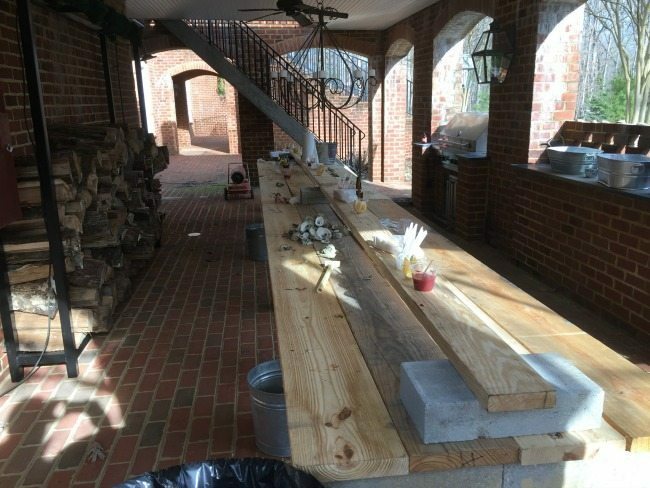 Your idea of an oyster shucking table is great. Inexpensive but very functional. I wish I would get invited to an oyster roast party! Yum. Ooooo sounds neat!!! I have never been to an oyster roast but now I really want to go to one after reading this!! I’ve never been to an oyster roast but your explanation makes the table sound logical. It sounds like you plan and organize so they’re the most enjoyable for everyone.